"it seems that Saint Lucia and the rest of the Lesser Antilles can expect much heavier Sargassum slicks this month." Heavier than we have now? Wow, i hope this is not the case. 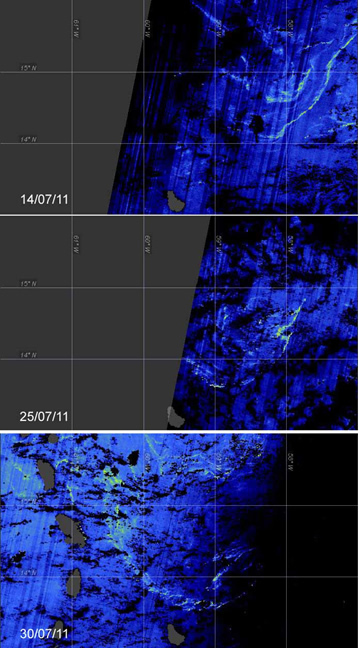 The logic being that a large slick was detected by IOS 70km offshore on July 30 using MERIS imagery. At that time there were already large amounts of Sargassum washing up on Saint Lucia's shores - but apparently undetected then by MERIS, probably because of the resolution of the MERIS sensor. So it seems that the Sargussum detected 70km offshore and drifting your way is in larger, wider mats, that can be "seen" by MERIS, than what's on your shores now.